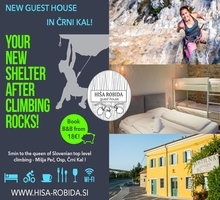 Each year in springtime, when warm sun starts to attract crowds of climbers, people living in villages close to climbing areas around Istria start to feel unhappy because of the poor ethics of some users of the climbing playgrounds. The reason for this article is therefore to educate those that might think their actions in climbing areas remain unnoticed and to remind those who are already good role models to follow some important rules. Climbing ethics are important because climbers are visitors and guests on someone else’s land. The continued access to climbing areas is a fragile thing. Each and every climber represents the climbing community. 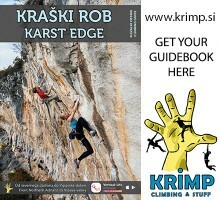 You need to know and follow the rules specific to your favorite climbing areas. Wild camping is strictly forbidden in Istria and is fined if you get caught by police! Check the cheap accommodation close to your area ;). Besides sleeping in tents or outside, it is also forbidden to sleep in a camper or inside a car on climbing areas parking lots. This is where you park your vehicle, grab your gear and start walking to the climb’s staging area. Carpool to the trail to save both fuel and parking spaces. Avoid use during peak times. Keep the group size small. Walk single file. Use the existing trails and don’t trample vegetation. Do not cut switchbacks. Stay away from sensitive areas. Walk through mud, not around it, to avoid widening the path. Never pick up fruits from private land, no matter how good it looks from the other side of the fence. This is where you put on your climbing gear and get ready to climb, have something to eat, discuss the route, look at strategies and take a potty break before starting. The easier the access, the more a staging area gets used, but even more remote areas are under impact, too. Make sure the staging area is large enough for everyone. Do not trample vegetation. Keep the noise down. Walk lightly. Pick up all lunch scraps. Properly take care of human waste. Be careful not to spill food during preparation. Pick it up if you do. Don’t bury uneaten food; animals will dig it up. Pack it out. Pack out all garbage. Any toilet paper and hygiene products should be placed in a sealable bag and packed out. Avoid building fires. Make sure all embers are thoroughly extinguished. Pick up what others may have left behind, be a role model! Leave your dogs at home if visiting a popular venue. Use dog-leash for your best friend all the time. This is why you are here—the ascent. While on the route, climbers can dislodge organic matter from cracks. Climbing shoes, ropes and your hands can damage plants, too. Avoid cliff edges, cracks and ledges that are prone to erosion. Use a chalk bag and keep it close to you to prevent spills. Be careful where you place your hands to avoid wildlife. Bird nests can be in cliff faces, and other animals use them for shelter, too. Try to communicate with climbing partner in a normal way. Too much shouting in a big crowd is not welcome at all! You may think of this as a personal thing, but we all need to consider our bathroom etiquette. 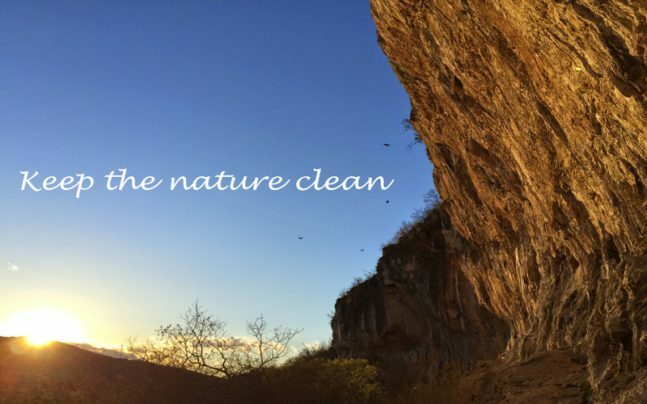 Human waste is a big problem in popular climbing areas. If there is an established toilet at the camp or staging area, use it—especially before you start your climb. In most places it is acceptable to pee on the ground, but go 100 meters away from the wall, water sources, the trail and campsites. Try to go on mineral soil or rock so vegetation is not harmed. When nature calls for a “No. 2,” you can use a cathole (dug hole) 6-8 inches deep, and cover it with dirt when finished. Put a rock on top to deter animals from digging it up. Any toilet paper and hygiene products should be placed in a sealable bag and packed out. There are not many things climbers should take care about in climbing areas. But the ones there are, are essential not to loose our playgrounds. 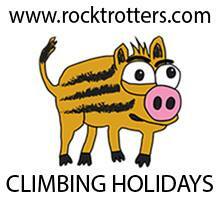 If we will take care about our climbing crags, we can climb in them forever. If not, we will just loose them really fast. Simple as that! Climbers, please take care about our nature!